Marketing Strategy | Octopus Creative Inc.
Who are your customers? Did you say, “everyone?” Uh huh. Okay. But who are they really? What are your organization’s real strengths, your Unique Selling Proposition? How is technology and the pace of change impacting your industry? Marketing Strategy is asking all the hard questions, finding the even harder answers and pulling off the very-nearly impossible by bringing it all together into something you can actually do in order to achieve marketing goals. Should you be selling your products online? Is there a huge opportunity waiting to be seized two towns over? Can you use your website as a revenue tool? We'll find out. Grey Goose vodka was going out of business until they made a single change that turned things around: they jacked up their prices. Buyers thought they were getting a luxury brand and now it's in every bar in the world. Lululemon's ideal customer is a 32-year-old professional single woman who makes $100,000 a year. Her name is Ocean. She's probably better worked out than most real people. You need a customer persona to help you start visualizing your ideal customers. Deciding on a Facebook or Adwords campaign is just the start; you'll want to know that you're getting the most bang for your buck by using the right channels and then being able to measure their impact. If you're a non-profit ask us about how we can help you apply for up to $10,000 a month in advertising for free! Technology doesn't just mean better marketing, it can also speed up the sales process. We'll take a holistic view of your company's processes and find ways that automation and technology can make things better. We're your sidekick, so we don't disappear after we get your website online. We'll keep optimizing your brand presence, keeping it up to date with new developments and seizing new opportunities. Is everything from the way you greet a customer to your invoicing system working to drive marketing results? We'll help you make sure it is. Marketing Strategy is where all the work you’ve done on Branding starts to change the way your business works for the better. It’s also where a bunch of people who do the marketing thing for a living (that’s us- hi!) get to unleash themselves on your business, and we always find ways to do things more awesomer. Always. more likely to report success than those who don’t. How often are you thinking about your 6 Ps of marketing? Product, price, promotion, place and branding all have to align with your overall strategy to communicate effectively on any channel, digital or otherwise. Let’s partner so you can reap the rewards of our mad marketing skills! P.S. not too sure what the other 2 Ps are? Chat us up! Extra, Extra! Truth is, the majority of people won’t find your tiny coupon in the logo soup of not-so-effective newspaper ads. 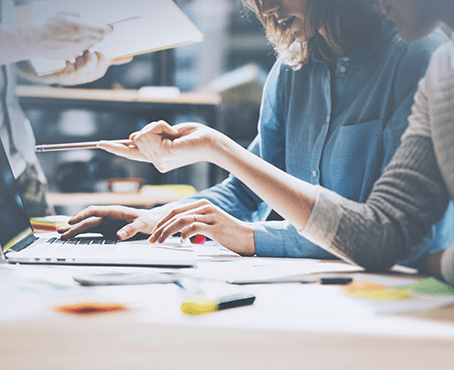 Instead, let Octopus Creative design and execute modern, highly-targeted advertising campaigns and promotions devised to optimize the use of your marketing dollars. How do you make a body shop fun to follow on social? Well, we know! A great contest can achieve so many goals at once. It can generate word-of-mouth and top-of-mind awareness for your brand, it can crowdsource original content for your business, it can incent people to purchase more from you. We deal with it all, from technology design to rule writing to advertising & execution. Celebrating its fiftieth year in 2018, Portage College is one of the largest colleges in Northeastern Alberta, with multiple campuses and thousands of students across undergraduate and post-grad degrees. It's also an important part of the community, holding events and adult education courses, and has a large and well-stocked museum of aboriginal artifacts. 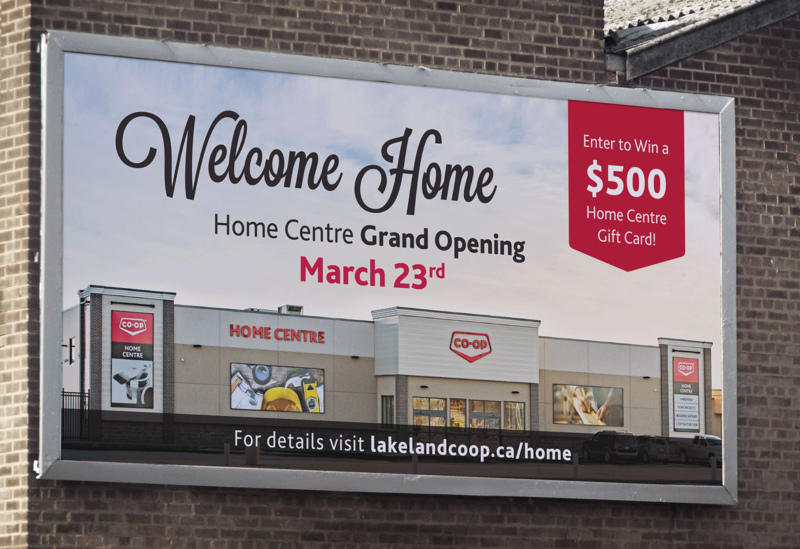 Lakeland Co-op is part of the nationwide Co-op chain and a 4,300 member business in its own right, with a gas bar, hardware store, clothing store, home centre and fuel cardlock amongst its varied product offerings. Although they have a great range of products, public perception is that they are more expensive than other brands, and too few people know about the key differences between a regular company and a co-op. The Iron Horse Trail is 300km of trail following the paths set down centuries ago by fur trappers and the first railways. 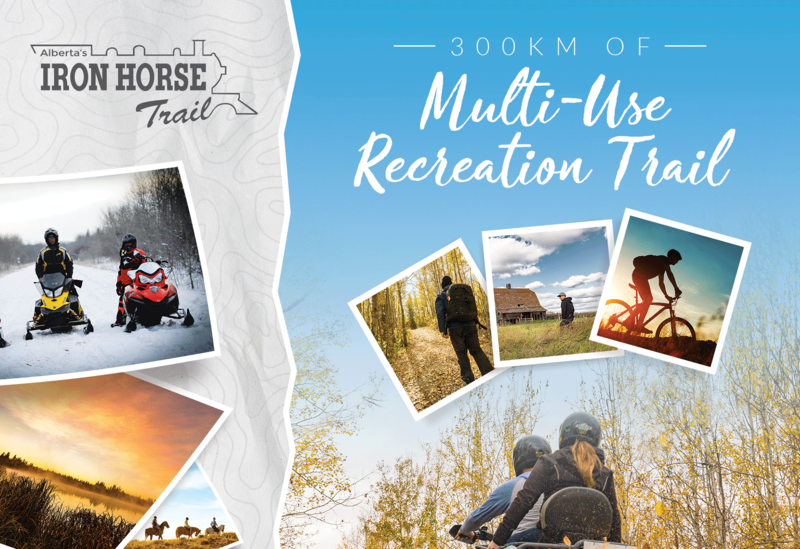 It's one of the province's crown jewels, and when the Riverland Recreational Trail Society wanted to promote the trail and expand its audience, they came to us. St. Paul & Eastalta Co-op / Federated Co-operatives Ltd.
Octopus Creative pulled off an integrated marketing campaign, spanning a trading area of more than 280km in just over a month. St. Paul and District Co-op and Eastalta Co-op officially formed Cornerstone Co-op in January of 2017, and as of January 2018 this campaign now provides the framework for a system-wide amalgamation campaign to be used by Federated Co-operatives Ltd. throughout the Co-op Retailing System. If you've got a small business in North Eastern Alberta, then KAFT CPA are your guys to call. A full-service, friendly business accountancy with a focus on helping small businesses by giving them solid advice. They specialize in tax preparation, bookkeeping and assurance- as well as being just plain lovely people. Our crew helped JD Collision rev up for their 40th year in style with a 40th-anniversary campaign, long-term marketing strategy, optimized branding, a new website and more! Since then, we've helped them dominate the web with social media, online advertising and SEO to make them the #1 shop in the Lakeland region. Rollie Cartier and Kerri Dechaine are one of the top real estate teams not only in St. Paul, not only in Alberta, but in all of Canada. They have a long-established business and a huge, always-evolving inventory of great properties, but more importantly they have a reputation for being friendly, nice folks who deal with their clients fairly. What does it take to shake up the industrial supplies business, which has been dominated by a few key companies for decades? Smart sourcing, cutting out the middle-man, and a professional web presence. Weaver Supplies is a start-up company that sells small, disposable products like safety glasses and grinding discs that companies in the construction or utilities businesses need to order often, and which can have a serious effect on their bottom-line. Tim-berrrr! Pevach Corp. is an arborist and tree services company based in Bonnyville, working on utility, commercial and residential projects. The company was just starting out when they first came to us, but had big plans to grow. We helped them develop a strong web presence and a proactive way of bringing new clients to the business. A family business from Bonnyville, HR2 has been involved in some of the coolest construction projects in the region for years, and has built a reputation for being down-to-earth, no-nonsense, straight-shooters. They've built everything from agricultural buildings to log homes so good they've been featured on HGTV's Timber Kings, to the retro-styled design of Jennie's Diner. Grande Parlour is now the premiere destination for theatre and performance in Cold Lake and the surrounding area. This quaint, intimate venue offered us the chance to work on their website and marketing in exchange for sponsorship, and as (inserts monocle) patrons of the arts we jumped at the chance. Fishing Lake is one of the few remaining Métis settlements in Canada; an independent, self-governing community with a long history and a commitment to their people and culture. It is also a thriving modern municipality with services and businesses, information on which needs to be readily available to everyone inside and outside of Fishing Lake. DMSCC is a not-for-profit that provides safe and secure shelter for women and families who are in crisis, as well as resources and advocacy for people across Northeastern Alberta. The Centre has been operating since 1982, and its key challenges have always been making sure that potential clients know about the Centre and can get in touch with it easily, and that it can get donations quickly and easily. Cornerstone Co-op Liquor, unsurprisingly, is part of Cornerstone Co-op, but with unique challenges and opportunities that made it an entirely separate product. As one of the region's largest and best-stocked liquor stores, with a monthly flyer that offers deep discounts on popular brands. We are proud to give back to the organizations we hold close to our heart. We donated a healthy portion of the costs of this re-brand and website build project as a part of our commitment to community. If companies in Northeastern Alberta need comprehensive benefits packages there's one name they need to know: Bryon Pearson. Bryon has been working in the industry for decades and has helped hundreds of companies give their employees the benefits packages they deserve. He was using an off-the-shelf website provided by his parent company when he came to us, and was looking to establish a new brand and new identity. The Lakeland is the region in which Octopus Creative was born, so we were overjoyed to be able to help this newly established initiative to get more people from across the country to visit and enjoy the area. Ageless Living had been an established aesthetic medicine practice in British Columbia for years, so when they came to Cold Lake they needed to make an impression while working within the established Ageless Living Brand. They already had a great range of services, from Botox(r) to breastfeeding consultations, and like many aesthetic medicine providers were seeing an increase in male clients, so we had to take this all into account to build a powerful brand. Canada's first and foremost charity for helping anyone affected by Fetal Alcohol Spectrum Disorder deserved a first class web presence, but when they came to us they had been saddled with an aging website that made gathering donations very difficult- the only way was to mail cheques to LCFASD's main office. They wanted a look that would take them into the 2020s, and we were happy to give it to them. A passion project, Calm Waters Colouring produces adult colouring books made by the people who enjoy them, with features that are absent from other books in the genre, like perforated pages and spiral bindings. They sell books in stores across Canada and have received a boatload of promotional opportunities from influencers & partners as a result of our efforts. Heck yeah I want to get ideas from Octopus Creative on how to improve my marketing! * By downloading this checklist I recognize that I am en route to achieve social media awesomeness, and that I am agreeing to contact (and occasional emails) from Octopus Creative. Don't worry, we'll never anchor you down with spam!